Guest post from Angie Schottmuller, an interactive Jedi, e-commerce expert, and multi-channel strategist at Interactive Artisan. What makes online content great? Is there a tangible metric, or is it purely subjective? I think it comes down to relevance. The more relevant the content appears, the more magnetic it becomes. Within this relevance I’ve discovered a formula for brands to magnetize content and optimize click-through rates… the Triangle of Relevance. Last year I was challenged with teaching my novice content management team how to write magnetic headlines and create remarkable content. Since such programs involve a myriad of tactics, I began thinking of how to break it down into a tangible, non-subjective checklist or generalized principle. This resulted in the birth of the “Triangle of Relevance” – a content strategy principle incorporating three angles – business interest, user interest, and time significance – to maximize relevance and magnetize content, creating user action. Business Objective. The products, services, company mission, goals, or people relevant to the business or organization. User Interest. The goals, aspirations, pet peeves, turn-ons, values, hobbies, favorites, values, etc. of your target audience.Tip: Define personas to make this step easier. Time Significance. Seasons, weather, holidays, life events (birthdays, anniversaries, etc. ), major sporting events, current events, trending news and more. Present urgency, popularity, or seasonality. Why is this content relevant now?Tip: Incorporate time relevance with clever word plays. Check Google Trends, Twitter Search, or Trendistic for trending topic inspiration. 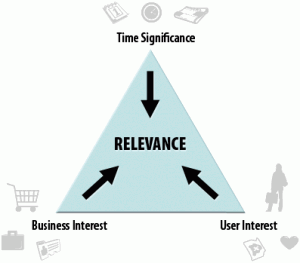 The key to magnetizing your content is effectively incorporating ALL three angles of relevance. The foundation of the triangle is business and user interests, but any angle can be used to initiate a relevant content concept. Time significance is often forgotten, and it’s also usually the most challenging to include. For your content strategy or blogging calendar, create a table or spreadsheet with columns for each Triangle of Relevance angle. It will help bring accountability to your headlines. Create separate tabs for each angle to list ideas for reference. Download the Content Calendar – Triangle of Relevance (Excel Template) to get started. Wegmans Sell Citrus fruit products Wellness Winter Fight the Winter Blues with Sun-Sational Citrus! In my experience, this principle has proved invaluable in planning email subject lines, blog titles, and Twitter posts. From a metrics standpoint, this principle can most effectively be tested by comparing and optimizing click-through rates. Below are some content elements to target for using this principle. As an Interactive Jedi, I created the Triangle of Relevance as a means of wielding the Force to lure target audiences into my inbound marketing strategy. What are your thoughts on the triangle? Is it the wrong shape? Have I missed a critical element of relevance that doesn’t fit? Can you think of other exceptional headlines that meet all three relevance criteria? Please add them to the comments below. Feel free to use this tool for your content strategy planning.